Foreign Trade Zone #227 is comprised of 2,942 acres within three sites located in Durant and Ardmore, Oklahoma. 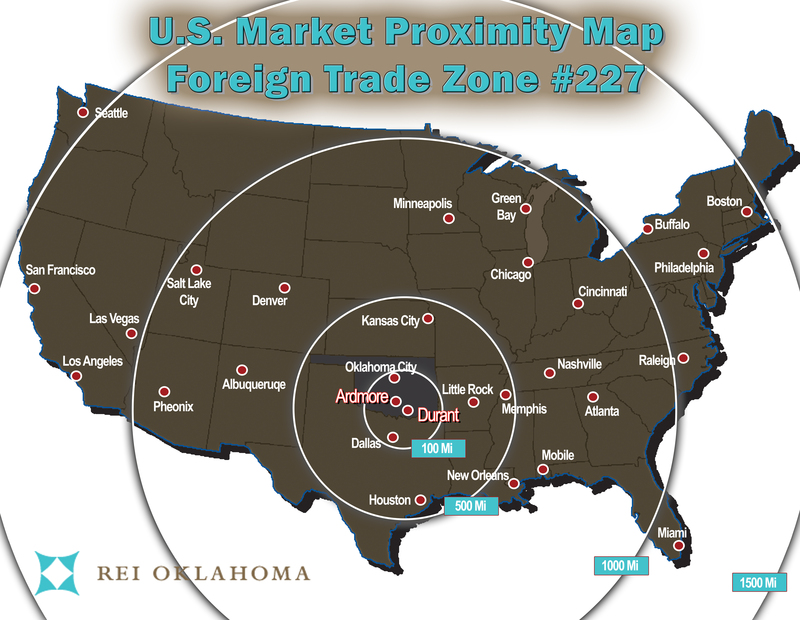 FTZ #227, established in 1998, is the only foreign trade zone in the rural southeastern and south central part of Oklahoma and the first zone in the state to operate outside the ports of Oklahoma City and Tulsa. It is located just one hour from Dallas, Texas, a national center for cargo distribution. By expanding the General-Purpose Zone to Ardmore, it will promote international commerce in this area, and will enable companies to expand their activities to increase competitiveness. Highway 69/75 is the most direct route from Laredo, Texas to Kansas City which is the east-west turnaround. This route also passes through the Port of Muskogee on the McClellan-Kerr waterway. I-35 (north/south) 45 miles west. It is also known as the North Texas Free-Trade Agreement (NAFTA) Superhighway System, a direct connection between the U.S., Canada and Mexico. I-40 (east/west) 95 miles north. Connects Greensboro, North Carolina to Los Angeles, CA. I- 20 (east/west) 95 miles south. Connects Florence, South Carolina to Pecos, TX. I-45 (north/south) 95 miles south. Connects Dallas, TX to Houston, TX. A Foreign Trade Zone is a secured area of land within the boundaries of the United States but considered OUTSIDE of the U.S. Customs Territory. Customs entry procedures do not apply to foreign merchandise when admitted to the Zone because the Zone is considered to be in international commerce (not in U.S. Commerce territory). The objective of the FTZ #227 is to provide businesses with global market opportunities and attract new economic development activity. Cash Flow – Payment of duty is deferred until goods are actually brought into the U.S. Customs Territory. This results in cash flow savings. Waste/Scrap/Defect/Damage – Duties are reduced or eliminated on materials subject to defect, waste, scrap and damaged. Exports – No U.S. Customs duties are paid on merchandise exported from an FTZ. Inverted U.S. Customs Duty Savings – In an FTZ, the FTZ user may elect to pay the duty rate applicable to either component material or the finished product manufactured from the component material, depending upon which is lower (must be chosen at time of entry into the Zone). The reduction or elimination of duties is significant. Reduced Cycle Time – Delays relating to U.S. Customs clearances are eliminated. Special direct delivery procedures expedite the receipt of merchandise in company facilities, reducing inventory cycle time. Production Machinery/Merchandise Consumed – Machinery for use in a zone may be assembled and installed before duties are owed on either parts or finished product rate. Merchandise used/consumed in Zone processing is generally not subject to duties. No Duties on Labor, Overhead and Profit – U.S. Customs duties are not owed on labor, overhead and profit attributed to production operations in an FTZ. If the same production operation were done overseas, the value of the labor, overhead and profit would be subject to U.S. Customs duty. Storage – The goods may be stored indefinitely. Quota – Most merchandise subject to U.S. quotas may be held in a Zone until quotas open. Zone to Zone Transfer – Transfers between Zones are permitted with no entry or duty requirement. Security – Lower insurance costs: the Zone is a high security area. Durant Regional Airport-Eaker Field – This is easily accessible to semi-truck traffic. It is approximately 1 mile from FTZ #227 and to the access of U.S. Highway 69/75. Trucking Terminal Station – Facility is adjacent to FTZ #227 & about ½ mile from U.S. Highway 69/75. Rail Access – Providers: Kiamichi Railroad (east/west) and Union Pacific (north/south) maintain two services daily. Railroad is approximately ½ mile from FTZ #227.